Should Parents Who Don’t Vaccinate Face Charges if Others Get Sick? Vaccination is quite a controversial topic in our modern culture. Currently, vaccination is left to the discretion of parents, yet many have begun to wonder if vaccinating one’s children should be mandatory. Children who are not immunized expose themselves, their families, and peers to a wide variety of deadly diseases. Parents are outraged over the possibility that their child could contract a disease that is entirely preventable through vaccines. Non-vaccinated children can spread dangerous illnesses and, because of this, some believe that parents who do not immunize their children should suffer legal repercussions. Others argue that vaccination is not just a medical concern, but an ethical one as well. 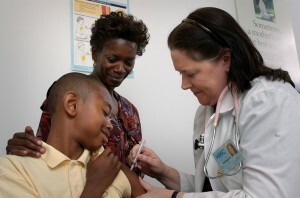 Many parents distrust vaccinations due to personal doubt, peer pressure, and other factors. This concern is understandable, but upon closer examination, it can be seen that the benefits of vaccines drastically outweigh the risks. Many individuals overlook the fact that the deadly diseases that we associate with the “old days” are not, in fact, entirely eradicated. These illnesses, such as measles, rubella, mumps, whooping cough, and chicken pox, are infrequent nowadays because of vaccines. Over the last year, it has been shown that measles is on the rise, and nearly 10,000 cases of whooping cough have been reported since the beginning of the year. With the growth of antibiotic resistant bacteria, it is even more important than ever to ensure that children are immunized. Vaccination is not merely a public health problem. In recent years, it has rapidly morphed into a full-blown ethical dilemma. Children are particularly susceptible to diseases when they are young, and many are not vaccinated until they are a year old. It has been shown that almost 30% of deaths in children from 1-59 months of age could have actually been prevented by vaccines. Parents who choose not to vaccinate do not just expose their own children but they risk the health of babies under the age of one who are not yet old enough to be immunized. If an un-vaccinated child comes into contact with a baby that isn’t old enough to receive vaccines, that baby has a greater risk of becoming infected. The purpose of vaccination is to perpetuate collective immunity. We are all members of the same society. If most of us are resistant to and vaccinated against deadly diseases, then we are more protected as a single body. The reality is that when parents choose not to vaccinate, other children may die. While serious death or injury can result from vaccines, as with any form of medication, these cases are not typical. In fact, the most common side effects of vaccinations are a mild fever and a sore arm. Vaccines are quite safe. They are necessary for the health and well-being of our society, and it is certain that more deadly diseases would occur without them. In order to avoid lawsuits, tragedy, and further infections, it is important for all parents to consider vaccination for their children. Click to see my Facebook post on this story.